These were the 12 easy pieces. For more on literary folks thinking about fashion, visist LooksAndBooks.com! I am currently in the last days of a fashion diet—although not entirely by choice. The term came from a New York Times article about the benefits of living on 6 pieces of clothing for a month: a “fashion diet” of sorts. Women, primarily, decided to downsize their wardrobes to see what would happen— and the results were surprisingly good. They wore lots of black, felt less materialistic, and spent absolutely no time deciding what to wear each day. The best (or maybe worst) part? No one else even noticed. No let me rephrase that: packing light was an abject failure. As far as I’m concerned, packing light is a completely separate skill from building a wardrobe and creating a personal style. For me, it’s a task fraught by ALL of my insecurities about where I’m going, let alone what I’m leaving behind. Leaving out a favorite skirt, for example, even though I have plenty of more versatile items, seems like the betrayal of a dear old friend. Don't let the smile fool you-- it is rueful. I am already regretting the fact that I will someday have to carry these all up several narrow flights of stairs to my new home. 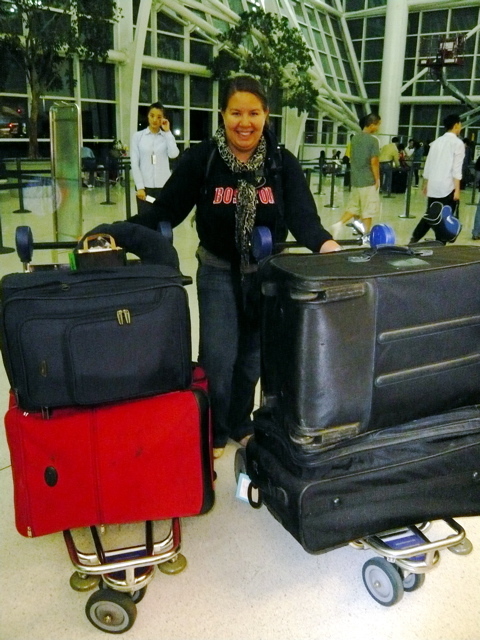 But I managed 1 enormous suitcase full of clothes… and packing being what it is, 2-3 other huge bags of everything else. I have since learned how to tell everyone, “Wo you tai duo dongxi” (I have too much stuff!). This would have been where the usual Kim story ended—I had an idea based on the New York Times, gave it a shot, and though it didn’t work out as planned, it provided food for thought! (See also: My attempt to “cold brew” iced coffee.) I would have promised myself that I would pack lighter in the future, and left it at that. The irony, of course, is that I had to live with these 12 pieces (or a basic equivalent thereof) for 2 weeks, so my theory was put to the test. For a host of reasons, the biggest of which was that I was staying in a TINY hostel while embarking on a potentially interminable apartment hunt, I stored the bulk of my belongings (the 3 huge suitcases) at Eva’s parents’ house. Her family was wonderful to help me out, because then I could be mobile, and secure in the knowledge that my belongings were safe. But due to a hectic week of moving and classes beginning, I haven’t had the time to pick them up yet. 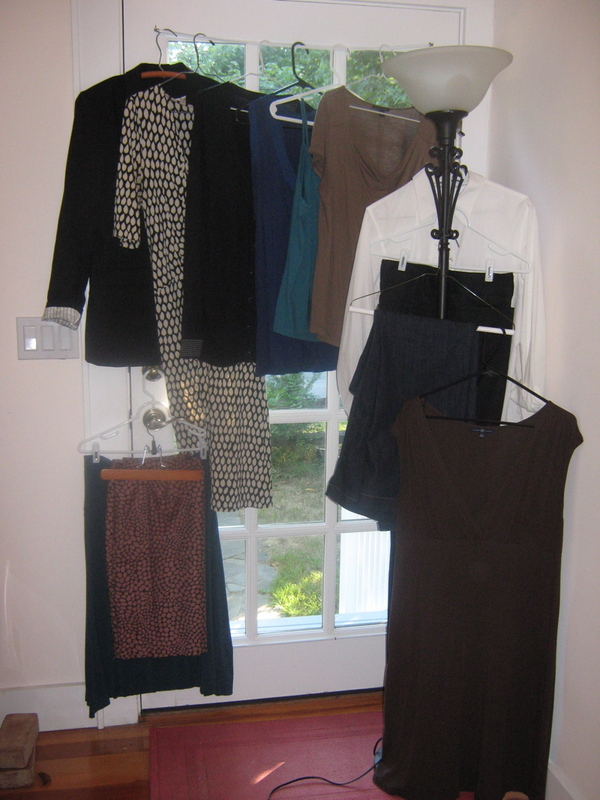 The Fashion Diet has had some interesting results: I’ve recycled every piece of clothing several times (and done two loads of laundry), since I’ve omitted the more formal or heavy clothes from the casual summer rotation. And no one really does notice what you’re wearing, and whether you’re recycling your outfits. ESPECIALLY living abroad, and meeting new and different people all the time. But I noticed that the comfort value of a shirt or pair of pants is an emotional one: can you be your best self in this outfit? Looking at my 12 pieces, I began to realize that clothes should be versatile, and perhaps sticking to one general color palette is a smart idea—mine adds some green, blue, and taupe to the standard black, white, and jeans. Any pieces that really diverge from the criteria of versatility, wash-ability, and basic styling had better be really special pieces. Every wardrobe, even a travel one, needs to have a “Wow” dress or a skirt and top that you feel perfectly comfortable in for any situation. Traveling to a foreign place offers so many challenges; discomfort for perceived beauty should not add to them! As I sit in a café in Taipei feeling at home here, wearing my favorite heathered green t-shirt and rolled up jeans with my red leather braided flat sandals, I think that a fashion diet is a great wake up call for women: it can help you appreciate what you like about the clothes you own and shed the superfluous layers bogging down your closet. It can also free up your mind to start thinking about something else, like living in your clothes, not living for them. This post cross-posted on the blog Looks and Books, thanks to the kindness of the fashionably literary Jill D’Urso. Jill’s discussion of fashion trends, literary tendencies, and all things Brooklyn has brightened many a day for me and her many fans. For more on literary fashion and fashionable lit, check out (and subscribe to) Looks and Books now! I’m impressed by your packing! The thing about choosing travel clothing that gives me more anxiety than anything else is summed up nicely by your question: can you be your best self in this outfit? I hear you, partner! about packing, this dice game master was (maybe still is) as bad as sista Ah-Jin. “fashion diet”? hmm… spiritually I agree whole-heartedly; in reality, it’s almost mission impossible (for this “pretty young woman” anyway=P)! want to hear my reasons? We shall trade stories over some beers soon (those we did not get chance to drink at the game b/c we were too damn good!!!) My God, I just discovered that you have Chinese blood and such a fine writer !!! Cool.